In this post, I’m going to show you EXACTLY how to borrow 105% of a properties value. In fact, this is the exact process that we have used to help 102 home buyers in the last year with getting a guarantor home loan. So if you want to buy your first home faster, and borrow up to 105% LVR of a properties value then you’ll love this new Guarantor Home Loan guide. When Zhara bought her first home, she had hardly ANY deposit. We helped Zhara borrow 105% for her first home in Brisbane. And because Zhara got a guarantor home loan she didn’t need to have a lot of savings and was able to buy her apartment before prices went up and stop wasting money on rent. Winning! Now that you can see that I know what I’m talking about, let’s dive into the steps that we used to get these results. The Guarantor Home Loan process begins with having someone that can help you out. A guarantor needs to own their own property, either a house or an investment and they need to have equity in it. This is because your bank will take security over a portion of their property in place of your deposit allowing you to borrow 105% of the purchase price. ✅ Needs to be from your immediate family, so your parents, siblings or grandparents. Some banks will also allow de facto partners, or in some cases uncles or aunts depending on their relationship with you. ✅ Guarantors property needs to be in Australia, the banks will not accept any property located overseas and the guarantor needs to be an Australian or New Zealand Citizen. ✅ There needs to be enough equity in their home, typically the guarantor will need to Lowe less than 80% of the property value on their home loan. We’ll go into this more shortly. ✅ Your guarantor needs to be currently working, a lot of banks will not allow a security guarantor from a retired or elderly guarantor. There are some exceptions, we have some banks that will accept self-funded retirees provided they get legal advice and have a reasonable exit strategy. ⛔️ Unrelated people who do not have an immediate relationship with you. Parents, and direct relatives can be the perfect guarantors… And unfortunately friends and work colleagues can’t act as guarantors. Do I need to show savings with guarantor loans? Although you can access over 100% of the purchase price from lenders using a guarantor loan, some lenders will still want to see at least 5% of the purchase price in what is called genuine savings. This is money that you have saved away yourself, but don’t worry there are some exceptions like using rent that you have paid as genuine savings. You can talk to us today about which lenders will not require genuine savings. Am I able to get a Guarantor Loan if I have owned a property before? The majority of banks that can do guarantor loans allow you purchase your first home, there are only a handful of lenders that will accept second home buyers because they believe they should have a good enough asset position to buy on their own. Obviously, this is not fair for people who have gone through a divorce or have been sick in the past but don’t worry we work with a few banks who are less conservative on guarantor loans. Is a guarantor home loan the same as a family pledge loan? Good news, a guarantor home loan is the same as a family pledge loan or a family security guarantee. 🏦 Macquarie Bank, IMB Bank, Heritage Bank, NAB, Bankwest, Gateway Bank call theirs a Family Guarantee Loan. Although the banks use different names, the products operate in the same way – using your parent’s property as security to help you borrow with a minimal deposit. The big difference between the banks is going to be your borrowing capacity (which we’ll cover shortly, this can make a $100k difference 😳), the maximum LVR they will allow (not all banks will go to 105% LVR) and the requirements for your parents as guarantors – some banks will not put a loan against your home. Feel free to get in touch and see which lenders will work for your individual situation, or call us on 1300 088 065. What about an investment property? One investment property will be accepted by only two or three lenders in Australia supported by a guarantor. Buying multiple investments is not generally accepted due to creating unnecessary risk. If the guarantor is in a strong financial position, then multiple investments could be an option. Investment properties can’t be used when getting a guarantor home loan. Benefits of a guarantor loan? ✅ The most obvious one is, no deposit is required: Being able to borrow over 105% of the property value means you do not need to have your own savings to purchase your first home. ✅ Receive discounted interest rates: The banks consider guarantor home loans lower risk lending as they have your parents property as security, so they will give you better interest rate discounts. ✅ Save money with no LMI premium: Lenders Mortgage Insurance can be several thousand dollars which you need to pay if you have less than a 20% deposit but completely avoided with guarantor home loans. ✅ Consolidate minor debts: Several banks will allow you to consolidate minor debts like credit cards or personal loans provided it fits within the 105% LVR. ✅ Limit the size of the guarantee: Your guarantor’s property will secure the deposit portion of your purchase which you can limit to 20-25% of the purchase price. If you want to get a guarantor loan, you need to have enough borrowing power. The maximum amount the banks will lend you is known as borrowing capacity. And borrowing capacity is a HUGE factor when you are buying a home. Borrowing Power is also called servicability by the banks, and it assesses how much you can afford to repay. Borrowing capacity is often referred to as borrowing power, this is the maximum amount a bank will lend to you based on your income and ability to repay that loan. Your borrowing capacity will ultimately depend on how much income you are earning, how much debt, credit cards and other liabilities you have and what your ongoing living expenses are. Broadly speaking, the banks will lend between 5 to 6 times your income. So if you are earning $50,000 you might be able to borrow up to $300,000. For a more specific example, we have shown how much a single person could borrow if they were earning $75,000 per year and had no credit cards, AfterPay or personal loans. To find out what your borrowing power is, get in touch with our team or call on 1300 088 065 and we can let you know. Can I get a bigger mortgage with a guarantor? You can get a bigger mortgage with a security guarantee because the bank will take your new home, and your parent’s property as security to lend against. Meaning in some cases you can borrow 105% of the purchase price, so if you were buying a home worth $500,000 you could borrow up to $525,000 with the help of a parental guarantee. Compared to a regular stand-alone mortgage which would only allow you to borrow a maximum of 95% against your home, or in the case of a $500,000 purchase up to $475,000. Can I use my parent’s income as part of my guarantor loan? Unfortunately, income guarantees do not exist anymore, this is where you could use your parent’s income in your home loan application for people who had insufficient income to purchase a property. These days banks will only allow a security guarantee, meaning they can only use your parent’s property instead of you saving up a deposit. If you want to look at increasing your borrowing capacity, you could look at closing down a few credit cards or chat to our brokers to see what your other options. Your guarantors can give you a hand with the deposit, in the form of a security guarantee but they cannot help with giving their income to increase your borrowing capacity. Does being a guarantor affect your mortgage application? How much can I borrow with a guarantor mortgage? ✅ Construction or Building Loans: 105% of the land price, and construction price. ✅ Consolidating Debt, as well as a purchase: In some cases, you can access 110% of the properties value. ✅ Investment Loans: You can access 105% of the investment properties value. Is it possible to borrow over 105%? Previously some lenders have lent up to 120% of the purchase price on a guarantor home loan, unfortunately, these loans are no longer available in the market. As we covered above, in most circumstances you can borrow up to 105% of the purchase price which generally covers the purchase, stamp duty and other costs. In some situations, you can lend up to 110% to consolidate some existing debts, but these debts generally cannot be more than 5-10% of the purchase price. The guarantor home loan calculator can help you determine the size of your limited guarantee and see if you are going to have any troubles applying with different banks. To do this, you first need to calculate how much the limited guarantee against your parent’s property will be. What does a limited guarantee mean? A limited guarantee reduces the overall risk taken on by your guarantors who are helping with your home loan. The size of the limited guarantee is calculated by taking the total loan amount, dividing it by 0.8 and then subtracting that from the property price. In this situation, your parent’s guarantee would be limited to $125,000 – instead of the total lending being $580,000. These calculations work out the limited guarantee assuming you keep your loan’s LVR at 80%, so you’ll need to double check your parent’s property has enough equity to cover this amount being $125,000. Don’t worry if this is getting confusing, you can speak with one of our Expert Mortgage Brokers and see if you can qualify for a guarantor home loan. Fill in a quick form, or give us a bell on 1300 088 065 and one of our specialist mortgage brokers will contact to chat about your situation. The reality is guarantor loans are great for getting you into the market quickly, but you want to aim to remove that guarantee within 5 years of owning the property. Removing your parent’s guarantee is going to come down to a few different factors, and usually, the best time to remove them is when your LVR is under 80% of the properties value. This is the best time to remove the guarantors from your loan as you will avoid paying lenders mortgage insurance, you qualify for better interest rates being under 80% LVR and the process generally involves less paperwork. How long does a guarantor stay on a mortgage? By default the guarantee is on the mortgage for the total loan term, being 25 to 30 years! In other words, if you never ask to have it removed it will stay on there for as long as you have your loan. 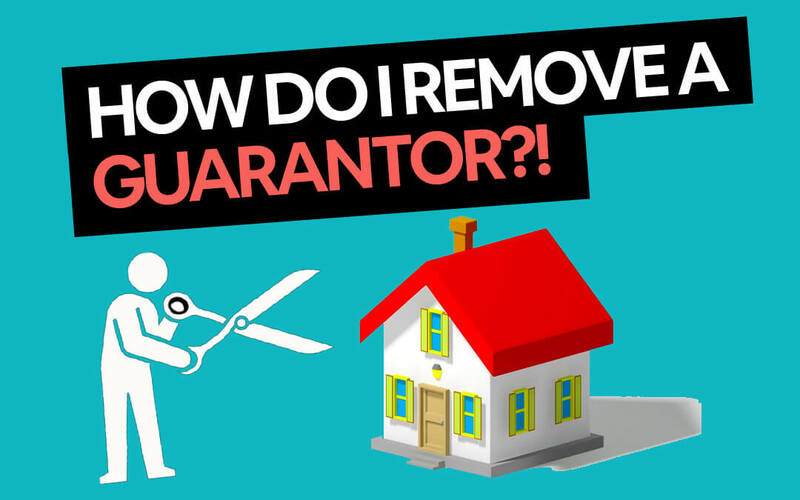 What are the steps in removing a guarantor from the mortgage? The exact process of removing a guarantor from the mortgage varies from bank to bank. But in general, you will need to go through these steps to remove a guarantee. The biggest difference in the process is in step #5: If you have an 80% LVR loan, you can submit a partial release. If you have a 90% LVR loan, you will need to complete an internal refinance and loan will be subject to lenders mortgage insurance approval. Cherise had been renting for a few years, and after moved a few times in the last 12 months she wanted to get her own home. She found a perfect 1 bedroom unit not far from where she had been living, and the property was going for $400,000. Cherise knew if she didn’t jump onto it quickly she could miss out. The tough thing was because she had been renting for a few years she wasn’t able to save up a big deposit, she would need at least 5% deposit or $20,000 plus her costs to purchase the property to get a home loan – so she was stuck, and wouldn’t be able to stop renting. Instead of having to save up $20,000 plus the costs Cherise spoke to her parents who owned their home which was worth $500,000 and had a $200,000 mortgage on it. Luckily for Cherise, she was able to use her parent’s property as guarantor security, she was able to borrow 105% of the purchase price to cover her home loan and other costs to get into her new home! Not to mention she saved well over $15,000 in Lenders Mortgage Insurance costs she would have otherwise paid if she had only a 5% deposit. Why did a guarantor loan work for Cherise? ✅ With her leftover savings she was able to buy a bunch of new furniture for her new place, and even go on an overseas holiday to Mexico. A lot of mortgage brokers and bankers out there rarely see guarantor loans, but we get them approved every day. We know which banks like dealing with them, how to get your home loan approved quickly and how to set them up to protect you and your parents who provide the guarantee. Nathan Vecchio and Hunter Galloway are experts at Guarantor Home Loans. If you would like to speak with a mortgage broker please call on 1300 088 065 or enquire online and one of our expert mortgage brokers will give you a call to discuss your situation.